China's Long March 5 rocket on a launch pad. According to Xinhua.net, China plans to launch the heavy-lift carrier rocket Long March-9 in 2028, said an official of China National Space Administration (CNSA) at the World Conference on Science Literacy 2018 on Tuesday. Li Guoping, director of the Department of System Engineering of the CNSA, said that the length of the Long March-9 will exceed 90 meters and the rocket would have a core stage with a diameter of 10 meters. It would be able to carry a payload of 140 tons into LEO, five times that of the Long March-5, said Li. The rocket's capacity would also reach 50 tonnes for Earth-Moon transfer orbit. 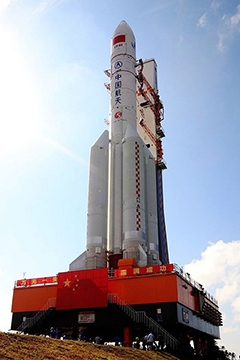 China is also developing a medium space rocket, the Long March-8, which is expected to make its maiden flight in 2020. The Long March rocket series have been launched 284 times, sending more than 400 spacecraft into space.